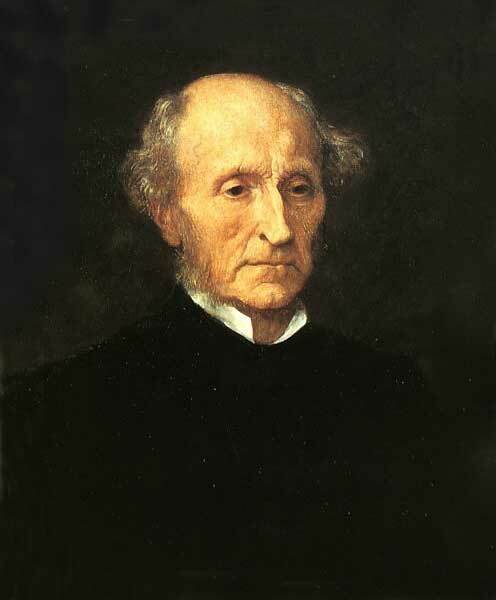 John Stuart Mill, the great utilitarian moral philosopher, and, by extension, teleologist. Immanuel Kant, the patron saint of all deontological ethics. The vast literature on deontology and teleological also points to many examples that show these categories of ethical thought to be overly schematic and, in some cases, to cut across each other. For example, if we characterize teleological ethics in terms of the aim to be achieved by an action, a distinction can be made between the actual consequences of an action and the intended consequences of an action. The intended consequences of an action may be understood deontologically as the motivation for undertaking an action. Part of this problem can be addressed by tightening up the terminology and the logic of the argument, but, as has been noted, the literature is vast and many sophisticated arguments have been advanced to demonstrate the interpenetration of teleological and deontological conceptions. We must, then, regard this distinction as a rough-and-ready classification that admits of exceptions. We can take these ideas of teleological and deontological ethics and apply them not only to individual action but to social action, and thus speak of the actions of social groups of human beings in teleological or deontological terms, i.e., we can speak in terms of the coordinated actions of a group being undertaken primarily in order to achieve some end, or actions undertaken as ends-in-themselves. This suggests the extrapolation of teleological and deontological conceptions to the largest social formations, and the largest social formation known to us is civilization. Can a civilizaiton entire be teleological or deontological in its outlook? Does a civilization have a moral outlook? I will assume, without arguing in detail, that a civilization can have a moral outlook, understanding that this is a generalization that holds across a civilization, and that the generalization admits of numerous important exceptions. Elsewhere I have noted the Darwinian perspective that any social group of animals that lives together in sufficient density for a sufficient period of time will evolve social customs for interaction. (This is a position that has been further explored in our time by Frans de Waal and Soshichi Uchii.) The lifeway of a particular people is coextensive with social conventions necessary for a social species to live together in a reasonable degree of harmony; what distinguishes regional permutations of lifeways are the climate and available domesticates. Both ethics and civilization grow from this common root, hence the xenophobia of traditionalist civilizations that unproblematically equate the peculiarities of a particular regional civilization with the good in and of itself. Can this synthesis of lifeways and ethos that marks out a regional civilization (and which is consolidated in the process of axialization) be characterized as overall teleological or deontological orientation in some particular cases? This is a more difficult question, and rather than tackling it directly, I will discuss the question from various perspectives drawn from an overview of the history of civilization. The emergence of settled agrarian-ecclesiastical civilization presents us with an archaeological horizon that appears globally in widely dispersed locations but at approximately the same time. (An archaeological horizon is “a widely disseminated level of common art and artifacts.” Wikipedia) Prior to an actual horizon, there are a great many suggestive sites that imply both domestication and semi-settled lifeways, but at a certain level (between 9 and 11 thousand years before present) the traces of large scale settlement and domestication of plants and animals becomes common. This is the horizon of civilization (or, more narrowly, the horizon of agrarian-ecclesiastical civilization). The horizon of agrarian-ecclesiastical civilization exhibits global characteristics that eventually culminate in the Axial Age, when regional civilizations are given definitive expression in mythological terms. Through separately emergent, these civilizations exhibit common features of settlement, division of labor, social hierarchy, a conception of the world, of human nature, and of the relation between the two that are expressed in mythological form, which in being made systematic (an early manifestation of the human condition made rigorous) become the central organizing idea of the civilizations that followed. 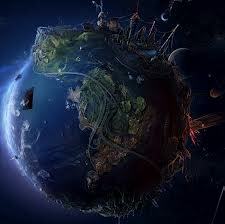 This period represents the bulk of human civilization history to date, a period lasting almost ten thousand years. Recently on my other blog I undertook a series on religious experiences and religious observances from hunter-gatherer nomadism through contemporary industrial-technological civilization and on into the future — cf. Settled and Nomadic Religious Experience, Religious Experience in Industrial-Technological Civilization, Religious Experience and the Future of Civilization, Addendum on Religious Experience and the Future of Civilization, and Responding to the World we Find — and thinking of religious observances emergent from human religious experience it is difficult to say whether these ritual observances are performed in the spirit of teleology or deontology, i.e., whether it is the consequences of the ritual that matters, or if the ritual has intrinsic value and ought to be conducted regardless of consequences. This may be one of the many cases in which teleological and deontological categories cut across each other. Agrarian-eccleasiastical civilization at times seems to formulate its central organizing principle of religious observance in terms of the intrinsic value of the observance, and in times in terms of the efficacious consequences of these observances. We can understand religion (by which I mean the central organizing principle of agrarian-ecclesiastical civilizations) as an existential risk mitigation strategy for pre-technological peoples, who have no method to address personal mortality or the cyclical rise and fall of civilizations (i.e., civilizational mortality) other than the propitiation of gods; once the transition is made from agrarian-ecclesiastical civilization to industrial-technological civilization, the methods of procedural rationality that are the organizing principle of the latter can be brought to bear on existential questions, and it finally becomes possible for existential threats to be assessed and addressed on the level of naturalistic human action. It would not have been possible to conceptualize existential risk in terms of naturalistic human action prior to the technological expansion of effective human action. Civilization is an historical reality that exhibits change and development over time. The particular change in civilization that we see at the present time is a transition from regional civilizations, reflecting the coevolution of human beings and domesticates (both plant and animal) ecologically suited to a particular geographical region, to a global industrial-technological civilization that is largely indifferent to local and regional ecological and climatological conditions, because a global trade network provides goods and services from any region to any other region, which means that the maintenance of civilization is no longer dependent upon local or regional constraints. 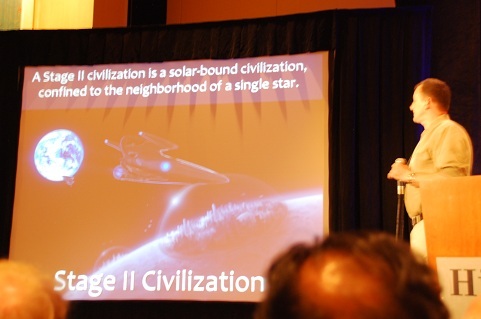 This development of global industrial-technological civilization is likely to dominate civilization until civilization either fails (i.e., civilization experiences extinction, permanent stagnation, flawed realization, or subsequent ruination) or expands beyond Earth and a self-sustaining center of civilization emerges in space or on another planetary body. In order for the latter to occur, human travel in space must move beyond exploratory forays and become commonplace, that is to say, we would have to see a horizon of space travel. I have called the horizon of human space travel extraterrestrialization. 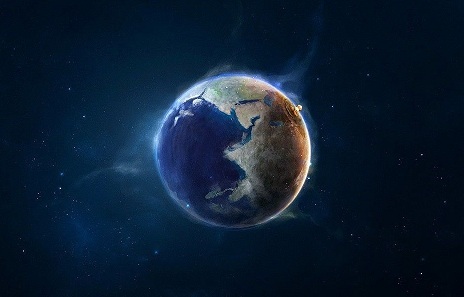 Until that time, civilization remains bound by the finite surface of Earth, and this means that our civilization is growing intensively rather than extensively. The intensive growth of regional civilizations exhaustively covering the surface of Earth means the closer integration of these civilizations (sometimes called globalization), and it is this process that is pushing regional civilizations (e.g., Chinese civilization, Indian civilization, European civilization, etc.) toward integration into a single global industrial-technological civilization. The spatial constraint of the Earth’s surface together with the expansion and consolidation of settled industrial-technological civilization forces these civilizations into integration, even if only at the margins where their borders meet. Is this de facto constraint upon planetary civilization a mere contingency pushing civilization in a particular direction (which in evolutionary terms could be called civilizational directional selection), or may be think of these constraints in non-contingent terms as a “destiny” of planetary civilization? We find both conceptions represented in contemporary thought. To think of civilization in terms of destiny is to think in teleological terms. If civilization has a destiny apart from the purposes of individuals and societies, that destiny is the telos of that civilization. But we would not likely refer to an historical accident that selects civilization as “destiny,” even if it shapes our civilization decisively. If we reject the idea of a contingent destiny forced upon us by de facto constraints upon growth and development, then we are implicitly thinking of civilization in terms of practices pursued for their own ends, which is an deontological conception of civilization. The contemporary idea of a transition to a sustainable civilization — the transition from an industrial infrastructure powered by fossil fuels to an industrial infrastructure based on sustainable and renewable sources of fuel — is clearly a deontological conception of the development of civilization, i.e., that such a transition needs to take place for its own sake, but this deontological ideal of a civilization that lives within its means also implies for many who hold this idea a vision of future civilization that has been revamped to avoid the morally catastrophic mistakes of the past, and in this sense the conception is clearly teleological. One of the most distinctive features of human consciousness is its time consciousness that extends into an explicit understanding of the future and its relationship to present action, and which developed and iterated becomes historical consciousness, in which the individual and the social group understands himself or itself to stand in relation to a past that preceded the present, and a future that will follow from the present. This historico-temporal structure of human life, both individual and communal, means that human beings plan ahead and make provision for the future in a much more systematic way than any other terrestrial species. This consideration alone suggests that the primary ethical category for understanding human action must be teleological. But this presents us with certain problems. Civilization itself, and the great processes of civilization such as the Neolithic Agricultural Revolution, urbanization, and industrialization, were unplanned developments that just happened. No one planned to build a civilization, and no one planned for regional civilizations to run into planetary constraints and thus to begin to integrate into a global civilization. So although human beings have the ability to plan and the carry out long term projects, many of the historical human realities that are among the most significant in shaping our lives both individually and collectively were not planned. In the future we may be able to plan a civilization or civilizational process and bring this plan to a successful conclusion, but nothing like this has yet been accomplished in the history of civilization. The closest we have come to this is to build planned communities or cities, and this falls far short of the construction of an entire civilization. Until we can do more, we are subject to a limited teleological civilizational ethos at most. While agrarian-ecclesiastical civilization tends to organize around an eschtological destiny, and is therefore profoundly teleological in outlook, and industrial-technological civilization tends to organize around procedural rationality, and is therefore profoundly deontological in outlook, we can think of a prehistoric past that is the source of both of these paradigms of civilization as either essentially teleological or deontological. The cerebral cortex, where matter is transformed into consciousness, is the point of embarkation for all our cosmic voyages. Comprising more than two-thirds of the brain mass, it is the realm of both intuition and critical analysis. It is here that we have ideas and inspirations, here that we read and write, here that we do mathematics and compose music. The cortex regulates our conscious lives. It is the distinction of our species, the seat of our humanity. Civilization is a product of the cerebral cortex. In my post 2014 IBHA Conference Day 2 I mentioned the presentation of William Katerberg, in which he characterized ideas of inevitability and impossibility as forms of teleology in scientific historiography. While Sagan may not be asserting the inevitability of civilization emerging from the cerebral cortex, all of these conceptions belong under the overarching umbrella of teleology, whether weakly teleological or strongly teleological. When we consider the highest expressions of the human mind in intellectual and aesthetic production, it is not at all clear if these monuments of human thought are undertaken for their intrinsic value as ends in themselves, or if they have been pursued with an eye to some end beyond the construction of the monument. Consider the pyramids: are these monuments to glorify the Pharaoh, and thus by extension to glorify Egyptian civilization as an end in itself, or are these monuments to secure the eternal reign of the Pharaoh in the afterlife? Many of the mysterious monuments that remain from past civilizations — Stonehenge, Carnac, Göbekli Tepe, the Moai of Easter Island, and the Sphinx, inter alia — have this ambiguous character. We can imagine a civilization of the prehistorical past essentially called into being by the great effort to create one of these monoliths. The site of Göbekli Tepe is one of the more recent and interesting discoveries from the Neolithic, and some archaeologists that suggested that the site points to civilization coming into being for the purpose of constructing and maintaining this ritual site (something I mentioned in The Birth of Agriculture from the Spirit of Religion). Teleology has been subject to much abuse in the history of human thought, as I have noted on many occasions. 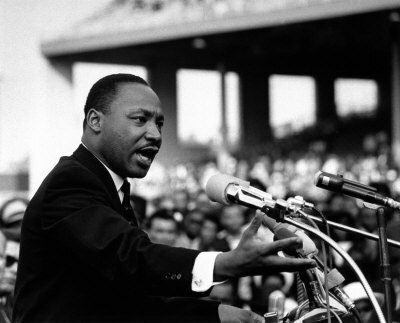 There is a strong desire to believe in meaning and purpose that transcends the individual, if not the entire species. The essentially incoherent desire for an meaning or purpose coming from outside the world entire, entering into the world from outside and giving a purpose to mundane actions that these actions cannot derive from any source within the world, is an imperfectly expressed theme of almost all religious thought. Logically, this is the desire for a constructive foundation for meaning and purpose; finding meaning or purpose for the world from within the world is an inherently non-constructive conception that leaves a vaguely dissatisfied feeling rarely brought to logical clarification. The first great work in western philosophy of history, Saint Augustine’s City of God, is a thoroughly teleological conception of history culminating in the -. Perhaps the next most influential philosophy of history after Augustine was that of Hegel, and, again, Hegel’s philosophy of history is pervasively teleological in spirit. A particular philosophical effort is required to conceive of human history (and human civilization) in non-Augustinian, non-Hegelian terms. Does there even exist, in the Western philosophical tradition, a deontological philosophy of civilization? In light of the discussion above, I have to examine my own efforts in the philosophy of history, as I realize now that some of my formulations could be interpreted as implying that civilization is the telos of human history. Does human history culminate in human civilization? Is civilization the destiny of humanity? If so, this should be made explicit. If not, a more careful formulation of the relationship of civilization to human history is in order. I have cited this passage previously (in Being Valued by the Other) and noted that while we cannot avoid using other persons as means to an end in the ordinary business of life, the crucial sense of this passage is that even when we are forced to deal with other persons as a means, that they must also also be considered as ends in themselves. This is simply a philosophical formulation of the intuitive idea that all persons are due respect and dignity regardless of their condition, and if we must routinely use others as a means to obtaining our contingent ends, we also have a moral responsibility to acknowledge at the same time that these others are ends in themselves, so that our contingent business with them must be conducted with respect and dignity. In brief, the saint is that individual who has devoted his or her life to the other. The Kantian formulation of his would be that the saint always regards the other as an end in himself, to the exclusion of the use of the other as a means to an end. It seems to me that, whether or not we are skeptical of sainthood, and whether or not we accept Wyschogrod’s definition of the saint, we must at least recognize the theoretical possibility of acting purely on the other’s personhood as an end in itself. As soon as we recognize this ideal possibility recognizing others as ends in themselves, we immediately see the all-too-real possibility of the anti-saint who acts purely on the other’s personhood as a means to an end (and which end is entirely independent of the other’s personhood). The extremes of the as-an-end-only relation to others and the as-a-means-only relation to others defines a continuum of possibilities, along which continuum the ordinary business of life can be located as it approximates one extreme or the other, or balances the two and inhabits the middle portion of the continuum. Thus what I am here calling the Kantian continuum is that continuum of gradations between relating to others purely as as ends in themselves through relating to others purely as means to an end. Between these two extremes are circumstances when we mostly treat others as ends but also a little as means, when we treat others equally as ends and means, and when we primarily treat others as means to an end and only as an afterthought also treat them as ends in themselves. Think of the situations and circumstances that one routinely encounters in the course of the ordinary business of life, as, for example, when one enters an establishment that still has living human clerks (as opposed to automated check out terminals) and you conduct a mundane exchange of money for goods, and perhaps acknowledge the clerk with a nod or a few scraps of conversation. This is a relationship that is primarily instrumental, and only as an afterthought do we knowledge the personhood of the other. While the purely instrumental approach to life probably belongs to pathology and is gratifyingly rare, the sort of transaction I have described is quite common in industrial-technological civilization. At the other end of the scale, short of ideal sainthood but still at the altruistic end of the spectrum, our relationships with friends and family are primarily person-centered relationships that are very much constituted by the meaning and value that these others have for us as persons. It is only as an afterthought that we ask them to do something for us, and the doing of the task is usually accomplished in a way the the personhood of all involved is fully engaged. In fact, in so far as we ask something of those who love us, they may well enjoy serving us or be eager to provide for our needs, and vice versa if we are being asked to provide for those that we love. It seems to me that Kant’s kingdom of ends comprises the whole of the Kantian continuum with the exception of the extreme end point of using persons exclusively as means and not at the same time as an end in themselves. Clearly, it is using others that is excluded in Kantian ethics. While I suspect that most will follow Kant in this, the implicit sanctioning of personhood as an afterthought, near the as-a-means-only end of the Kantian continuum, contains in embryo much of that which has made life in industrial-technological civilization so dehumanizing and depersonalizing. I am not here trying to censure Kant, or to find him responsible for the failings of modern society — there are a great many philosophers who have vigorously taken up the critique of Kantian ethics, and ably so — but I only wish to illustration how the Enlightenment universalism of Kant so easily passes over into its other. The very off-handedness of a recognition of one’s personhood as an afterthought is itself something less than full personhood — and, often, we feel it, but at the same time we understand it, so it does not often injure us. It is difficult to point a finger at any individual as particularly responsible for the affronts to human dignity that assail us every day in industrial-technological civilization, since it is all-too-easy to understand how things became the way that they are now, and how difficult it would be to change them. If, when engaged in some trivial transaction of contemporary life, one were to attempt to engage with the other first as a person, one’s actions would probably immediately elicit suspicion. Some few have the gift of engaging in a genuine way with others, even for a brief period of time, but it is not found all that often. The bureaucratization of society that so marks industrial-technological civilization incorporates a pro forma recognition of the personhood of the other, in deference to our moral intuitions of the respect and dignity due to all persons, but it is precisely the pro forma character of the recognition that drains it of human meaning. Many have commented on the formalism of Kant’s ethics, and in the passage I quoted above Kant says we must, “abstract from the personal differences of rational beings,” yet it is the personal touch that most often breaks through as a recognition of personhood in otherwise anonymous transactions. How many times in life does it happen that we are engaged in the formal courtesies required of us by society when someone accidentally goes “off script” and all present laugh at the deviation and suddenly there is a more relaxed feeling and people feel freer to be themselves and to express themselves? This, too, is a mutual recognition of personhood — of the concrete and fallible dimension of personhood that makes us human — and it is perhaps this kind of recognition of personhood that is most valued informally because it doesn’t come across as odd or strained like some ham-handed attempts to engage others. There is not only a natural style in literature, but also a natural style in personal comportment, and when we encounter this natural style in manners we are astonished and delighted, for we expected to find a type, a cipher, an official, a bureaucrat, and instead we find a man. We also find ourselves, and feel a little freer to be human in the presence of such an other. Sartre’s lecture “Existentialism is a Humanism” has had a significant influence on my thinking. I’ve read it many times, and I have thought about its themes throughout my adult life. It was saying things like this that gave Sartre in particular (and existentialism in general) a reputation for being amoral. Is that all there is to say — invent? Thinking of this recently I realized that a rough distinction can be made between what I will call existential choices and moral choices. Of moral choices we can reasonably (and coherently) ask whether the choice an individual makes is right or wrong. I will define existential choices as those choices of which it is not as reasonable, or perhaps even incoherent, to ask whether the choice, once made, was right or wrong. An existential choice might fail to have a right or wrong response because there are moral (and presumably equal) reasons on both sides of the question. This is obviously an instance of moral choice and existential choice overlapping. It is important that we recognize such a category of choices, because so much of life consists of choices regarding which there are moral claims on both sides of the question, and no one side or the other is obviously the side of greater good or lesser harm. I will call these choices impure existential choices. The scenario that Sartre outlines in his lecture is, as I see it, an impure existential choice. There are valid moral reasons for the student to remain to support his mother, and there are valid moral reasons for the student to leave to join the resistance. Neither the reasons on one side of the other, however, seem to preponderate. Pure existential choices, on the other hand, are when moral issues are not at stake (or, at least, not so clearly at stake). Those pure existential choices that involve life-altering events are obviously of most interest to us. When you choose to marry, if you do so choose, and whom you choose to marry, is an existential choice. There is no right or wrong answer, and it would be misleading in most cases to identify marriage as a moral choice. But it is a life-altering choice, and that makes it an existential choice of some moment. And we can see from the example of marriage that trying to transform an existential choice into a moral choice is probably a mistake. Imagine saying to yourself, “I ought to marry this person,” rather than, “I would love to marry this person.” It is hard to imagine a circumstance in which a marriage contracted under moral duress, i.e., obligation, could be a happy or successful marriage. If you consider the possibility of self-imposed exile or of staying in your country of origin, this is a pure existential choice, and if you do choose self-imposed exile, you must then also choose a destination for your exile, and this is another pure existential choice. You will have a profoundly different experience of life if go to India or if you go to Peru, thus the choice marks a bifurcation in life, and it is difficult (or misleading) to invoke moral reasons for the choice made. A pure existential choice is a bifurcation in life. A small bifurcation constitutes what philosophers formerly called the “liberty of indifference,” such as whether you sleep on your right side or your left side. Such existential choices may leave the rest of one’s life intact and largely untouched. A great bifurcation changes everything that follows. A pure existential choice in an important matter sets the course for the rest of your life; it also turns aside from unexercised options in life that pass into the twilight of unactualized possibilities: experiences we never had, people we never met, places we never went, meals we never ate, music we never listened to. This is the domain of sentiment, of yearning, and of regret. Pure moral choices do not preclude the possibility of pure existential choices, and vice versa: pure existential choices do not preclude the possibility of pure moral choices. Most of the choices we make is life are mixed — so mixed as to make them impossible to classify. What I want to do here is simply explicitly recognize the possibility of pure existential choice as a domain of human experience. It is perhaps paradoxical to point out that theory choice is often an existential choice. This is significant, not least because theory choice has come to play a significant role in philosophy at least since Thomas Kuhn’s work on scientific revolutions. One of the controversial conclusions that Kuhn’s theory was taken to imply was that choice among theories was essentially irrational. But if theory choice in science is arbitrary, how can it maintained that science is a more-or-less accurate explanation of the world? I hope that the paradoxical character of the assertion that theory choice is an existential choice will become obvious in what follows. If a theory is chosen on the basis not of its truth but on its presumed moral merits (with “moral” understood in the narrow sense of virtues specific to human beings), we know intuitively that such a theory lacks the minimum theoretical legitimacy one would require of a theory. A theory must be chosen for theoretical reasons, or it is no theory worthy of the term. This is an important point, because it implicitly plays and has played a prominent role in the political debates of our time. Social, political, and economic theories have been advanced and advocated on the presumed benefits of their moral merits, and not on the basis of the merits of these theories as theories. This has almost always been the case with theories of utopian social organization that in practice become dystopian horrors. Favoring a theory for its presumed (and narrowly defined) moral consequences may not be necessarily bad for theory and bad for the moral condition of humanity, but I can’t think of a particular instance when such a choice was anything other than bad. However, we can say that a good theory is a true theory (or an objective theory, or that it possesses some other theoretical virtue), in which case a theory chosen on the basis of its moral merit — i.e., on the basis of its specifically theoretical virtues — possesses the theoretical legitimacy to pass muster as a theory. In recognizing this (if, in fact, one does recognize this), we recognize that theory choice is an existential choice, not a moral choice. If we consider, for example, various theories of justice — retributive, distributive, procedural, restorative, organizational (which I would prefer to call institutional), and transformational — each has its advantages and disadvantages (moral and otherwise). It is very difficult to say, on the whole, whether any one theory of justice is morally better than another. So we choose our theory of justice on the merits, as they say. This makes a choice of a theory of justice an impure existential choice, with moral considerations weighing in on both sides of any theory of justice, but no clear preponderance of moral weight on one side of the question of the other. Lacking clear moral preponderance, the choice of a theory of justice to adopt, while freighted with moral concerns becomes a de facto existential choice in which it is incoherent to ask whether the choice was right or wrong. To sharpen the counter-intuitive paradox this can be made even more personal by considering theories of ethics: each ethical theory has advantages and disadvantages. Also, we cannot coherently step outside ethics and ask which of these ethical theories is right or wrong, for to ask whether something is right or wrong is to presuppose an ethical theory, and if we have presupposed an ethical theory we can, in turn, inquire about the choice of this theory. Thus ethical theory choice is a pure existential choice. 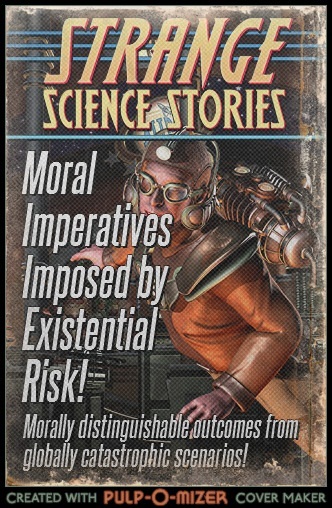 In so far as you choose a particular ethical theory (and in so far as you organize your moral experience you have a moral theory, whether or not you know it), you make an existential choice in which it is logically impossible to invoke moral reasons for the choice without becoming involved in an infinite regress. When we move on to less personally poignant classes of theories — physical theories, mathematical theories, metaphysical theories, and so on — our choice of theory is only rarely (if ever) a moral choice. Theory choice is primarily an existential choice, and that is as much as to say that it is a rigorously amoral choice. Theories shape our world. Theories organize our knowledge and experience, and in so doing organize our lives. In so far as theories shape our world and organize our lives, it would be difficult to name any more profound decision an individual makes than the theories that they adopt, and yet these theoretical choices are mostly existential choices. Today I had my opportunity to speak at the 100 Year Starship Study symposium. Prior to arriving, nothing was said about the length of individual presentations, or about the number of one’s PowerPoint slides. Upon arrival, my first contact with organization staff consisted of being scolded for the number of slides I had prepared (132). Also, the speakers were held to a close 20 minute time limit, with no appreciable time between speakers. As a consequence, I had far too much material. I had to talk fast in order to give the better part of my presentation, and I had to skip over a good deal of material. So this was dissatisfying. My sister suggested that I gestured too much with the remote control for the slides, that I didn’t look at the audience enough but rather looked at the screen, and that I said “so” too many times. These constructive criticisms were welcome, as they were valid. The result was that my talk was less than optimal, but I still managed to get my point across in a few areas. Given my near total lack of experience in public speaking, if I judge myself leniently for my inexperience, I could say that I didn’t do too badly. But it could have been much better. 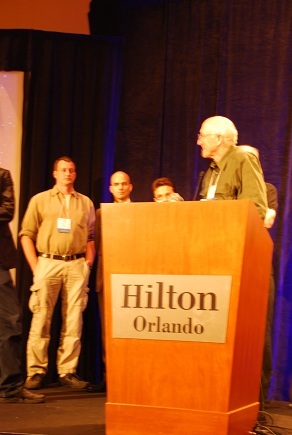 A couple of people approached me after I spoke and expressed an interest in what I had to say, which was rewarding. In his exposition of the principle of mediocrity, C. Weidemann made an analogy with a lottery ticket, which was both insightful and a fruitful way to think about mediocrity after the Copernican Revolution (which is something I think about often). He suggested that most holders of a lottery ticket realize that they hold the “average” ticket, which is to say that they don’t win the prize. However, with further investigation you may discover that you have in fact won the prize and that the ticket you hold is an exception to the mediocre rule. This incorporates a perspective of increasing knowledge into the formulation of the principle of mediocrity, which corresponds better to our actual epistemic perspective than an unstated assumption of static knowledge. In another talk, as well as in remarks following the presentations, K. Denning of York University offered another good example of a highly optimistic estimate of the accuracy of futurist predictions, which is something that I discussed previously in Synchronicities of Futurism. Professor Denning in particular cited H. G. Wells’ 1908 work The War in the Air as preternaturally accurate futurism. I should emphasize that this was not the focus of Professor Dennning’s talk, but only a comment made in passing, but I think that this is revelatory of a particular conception of history, as I also had in mind when I mentioned this in connection with Michio Kaku and the Tofflers. If you hold that history can be accurately predicted (at least reasonably accurately) a very different conception of the scope of human moral action must be accepted as compared to a conception of history that assumes (as I do) what we are mostly blindsided by history. A conception of history dominated by the idea that things mostly happen to us that we cannot prevent (and mostly can’t change) is what I have previously called the cataclysmic conception of history. The antithetical position is that in which the future can be predicted because agents are able to realize their projects. This is different in a subtle and an important way from either fatalism or determinism since this conception of predictability assumes human agency. This is what I have elsewhere called the political conception of history. Perhaps it is only when I see this perspective up close that I realize how different it is from my own point of view. When I originally formulated the idea of the political conception of history I saw much of myself in it, but now that I realize that it corresponds to a commitment to the accuracy of futurism, I see in concrete detail why I must reject it except for special cases that are the exception to the rule. The political conception of history.